The forum highlighted and criticized several pieces of municipal policy in the pipeline – notably, the Historic Area Height Review, the Vancouver Views and Higher Buildings Downtown Policy, and the Metro Vancouver Regional Growth Strategy. These policy decisions will have lasting effects on the look and make-up of the city. 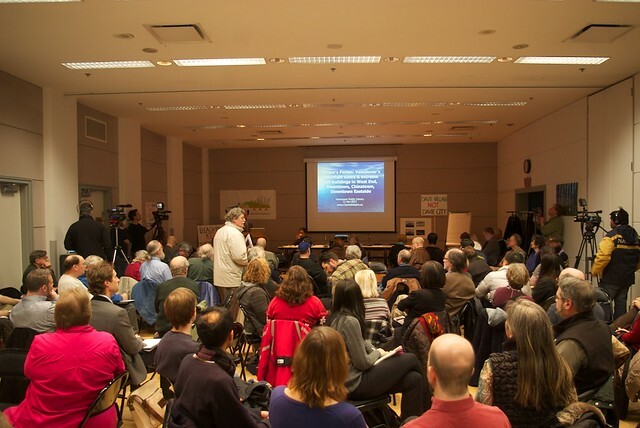 Many attendees noted that the Height Review will cause gentrification of the Downtown Eastside and Chinatown. As one speaker said: “higher buildings mean higher prices.” Ivan Drury of the Downtown Eastside Neighbourhood Council (DNC) called on the audience to join and support the DNC’s efforts to stop the Height Review, because the condo plans will hit the Downtown Eastside the soonest and the hardest. The Regional Growth Strategy shifts land-use power from municipal governments to the Province, Metro Vancouver, and Translink. These bodies are less directly accountable (the latter totally unelected), and Helten as well as others are concerned that the capacity for future citizen involvement is disappearing. The last chance for the public to speak on that policy was December 2nd, but many citizens still haven’t heard about it. Decision on the other two policies go to City Council Thursday evening of next week. Posted in City Hall, Downtown Eastside, Gentrification, Housing, News. Bookmark the permalink.